Thanks for showing us a great time. Here's a few pics from our adventures, the lighting on the snook pics made the fins look really cool. 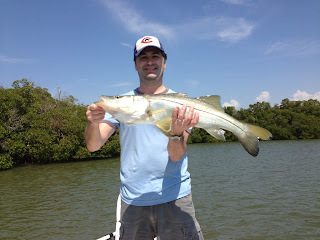 Fishing was a little slow but we caught some nice fish and a good selection. Live White bait was unavailable but we put some nice Snook, Snapper, Sheepshead, small Reds and other species in the boat. Beautiful afternoon. I hope the Snapper ate well. Thanks Rz. Thanks for a great trip. Hope to go again soon! Attached are some pictures of the Snook. What a treat that was to catch.